Coastal floods are regarded as one of the most dangerous and harmful of all natural disasters. Rapid urbanisation in coastal areas combined with climate change and poor governance can lead to a significant increase in the risk of local pluvial flooding coinciding with high water levels in rivers and high tide or storm surges from the sea, posing a greater risk of devastation in coastal communities. There is a need to improve forecasting, prediction and early warning capabilities using state of art science and technology to help policy makers and emergency services to develop robust risk reduction strategies. However, forecasting and prediction is only part of the answer. Of equal importance is the ability to effectively warn the population in areas that will be affected, and that warning systems for the general public are integrated into broader management strategies and supported by appropriate institutional and organisational arrangements. Preparing for effective response to extreme events not only involves technology but also significantly social, economic, organisational and political considerations. The PEARL project seeks to fill in the lack of interaction between social aspects and technical measures – appearing to be a major hindrance for solving some of the greatest problems associated with floods and flood-related disasters. 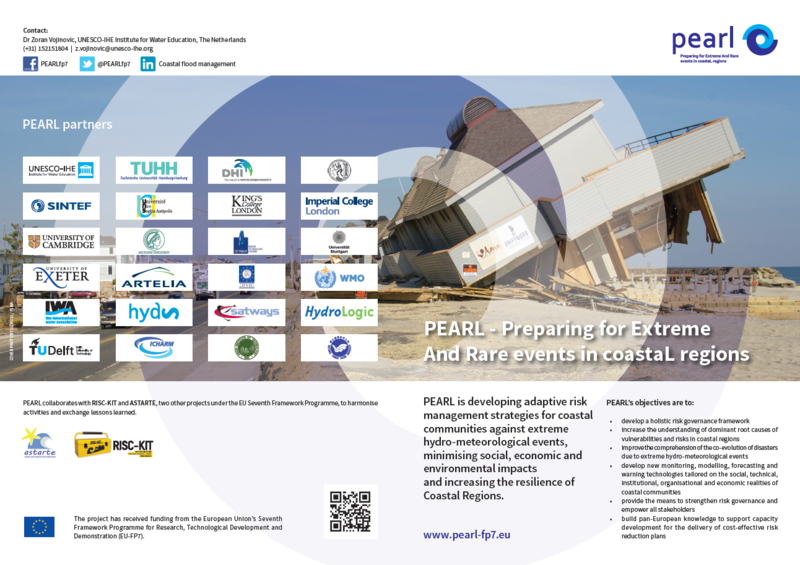 Based on the belief that problems are best solved by attempting to correct or eliminate root causes, as opposed to merely addressing the immediately obvious symptoms, the PEARL project aims at developing adaptive risk management strategies for coastal communities focusing on extreme hydro-meteorological events, with a multidisciplinary approach integrating social, environmental and technical research and innovation [see objectives]. PEARL will consider all fundamentals in the risk governance cycle, focusing on the enhancement of forecasting, prediction and early warning capabilities and the building of resilience and reduction of risk through learning from experience and the avoidance of past mistakes. The project is organized in eight different work packages. PEARL received funding from the European Union’s Seventh Framework Programme for Research, Technological Development and Demonstration (EU-FP7) under the theme “Coasts at threat in Europe: tsunamis and climate-related risks” (ENV.2013.6.4-3) and collaborates with other relevant FP7 projects, such as RISC-KIT and ASTARTE under the same topic. To have an overview of the project, download the PEARL Flyer.